HOW DO YOU INVESTIGATE YOUR OWN MURDER? Professor Thomas Payne didn’t intend to wind up dead on his caving vacation, and in truth he wasn’t the victim. But proving his identity to the police becomes tricky after they pull his passport off the lookalike body. Things go from bogus to baffling when a mysterious phone call at the crime scene leads to the arrest of the young scientist. His fate seems sealed when the victim’s fingerprints match the professor’s work visa. Intervention by the police inspector’s daughter frees Thomas to search for clues to prove his innocence. So, it’s off around the UK with sculptress Terri, one jump ahead of the authorities — and running from his estranged sociopathic father. One slip and claustrophobia will be the least of their problems. Thomas’ journey soon becomes as much about healing his troubled past as recovering his present self. Along the way, he’ll battle betrayals by his envious staff, romance the rebellious artist, and suffer harrowing misadventures at historic sites in Ireland, Scotland, and Wales. Well, at the certain risk of sounding absurdly immodest, my novels are very well written. Not to knock the writing of anyone in particular, I care about how I use language, the way authors did 50+ years ago. Sadly, I think that is too often not the case today with ‛popular’ fiction. The novels themselves are unusual from several angles. One is that they tend to cross genres. Clonmac’s Bridge, for example, could easily be categorized as an archaeological thriller, or a business drama, an historical fiction, a love story, or even — at a stretch — a literary work. Similarly, Death Is Overrated is a mystery, to be sure. But it’s just as much a drama of a man overcoming the wounds of his childhood. It could fit into the adventure genre, too. Cossacks In Paris is solidly in the historical fiction genre, but even there the history is mostly in the background. The personal relationships of the characters are front and center. All of them, though, are — again immodestly — far from pretentious or obscure or grim. They’re all fast paced and easy to read for anyone who loves an exciting, engrossing tale. In short, by design, they’re the sorts of things one might have found on the shelves in 1950, yet updated for a contemporary reader in terms of pace and style. Well there is the trite but true: write every day, as many hours as you can. As importantly, I’d say: try to lead an interesting life and be a careful observer as you go. I’ve had many adventures over the years and it has helped shaped my mind and values. That can’t help but leech into your writing. 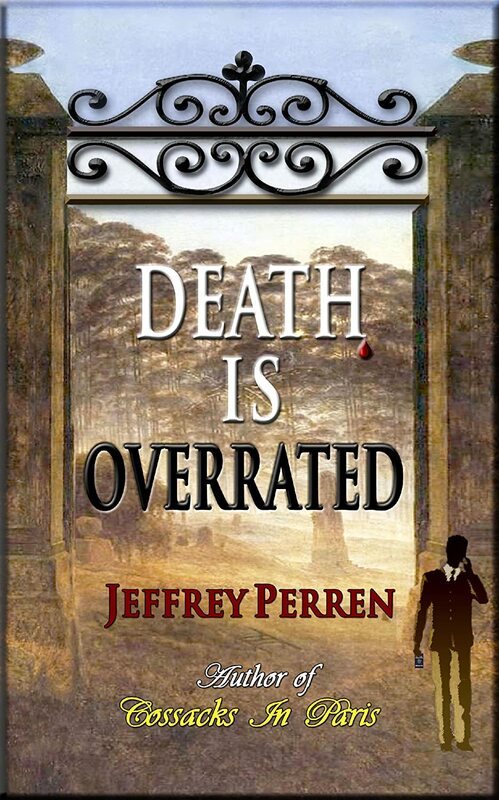 Jeffrey Perren is an American novelist, educated in philosophy at UCLA and in physics at UC Irvine. The lure of writing soon outweighed everything, though. He was born in Independence, MO right around the corner from Harry Truman’s house. But then, at the time, everything there was right around the corner from Harry Truman’s house. Right now he lives in Sandpoint, Idaho with his wife. He wrote his first short story at age 12 and went on to win the Bank of America Fine Arts award at age 17. Since then he has published at award-winning sites and magazines from the U.S. to New Zealand. He has had short stories published at the award-winning sites Apollo’s Lyre and Mystericale. I want readers to see in my work the view that life can be good, that we can flourish, and our thoughtful choices have a huge influence on whether or not we do. Sheer persistence in the face of obstacles over a long, often difficult period are what make great drama — and a fulfilling life, in my view. Typically, in life as opposed to literature, those hurdles are not big, dramatic one-time events. More often, they’re the day-to-day inertia of wet human cotton balls, to use a horribly mixed metaphor. Those barricades are usually held in place by small souls who, paraphrasing Mencken, fear that someone, somewhere may be happy. At heart, I’m a romantic writer – but in the 19th century sense of that term.